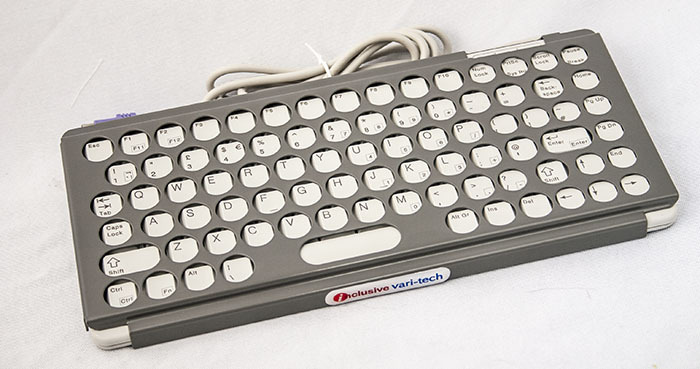 The following is a list of specialist hardware keyboards designed for people with physical, visual or cognitive disabilities. See my Keyboard Access page for information on keyboard accessibility, on-screen keyboards, one-handed typing and switch access. This keyboard is easy to use and set up. It is also extremely versatile if you’re willing to delve deeper it can do some interesting things such as allow final position for selection of letters (meaning that you can rest against the keyboard and move your hand to the key you want before releasing). 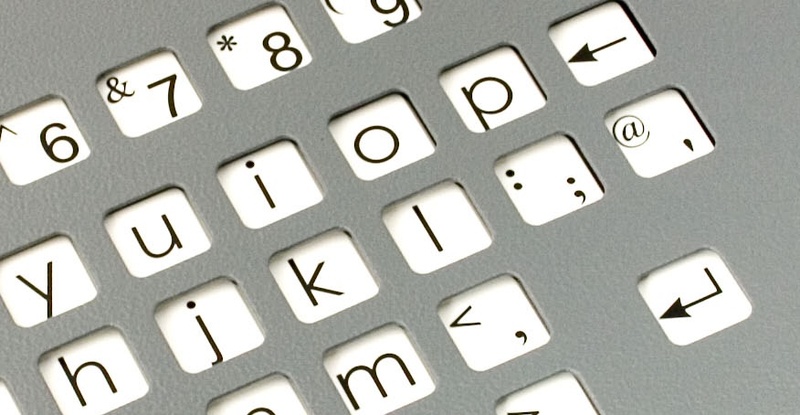 It also allows for a range of custom keyboard layouts which you can print out yourself. The IntelliKeys is no longer being manufactured and is getting more difficult to get hold of. In many ways, it has been replaced by the iPad and other tablets, but I still think there is a place for it and it’s a shame it is lost forever. Follow this link to find out more about the IntelliKeys keyboard. Keyguards are one of the most low-tech but effective solutions for people wanting to use a physical keyboard but finding it difficult to hit the keys accurately. The keyguard pictured is available from Inclusive Technology and it fits nicely over a keyboard it was designed for. Keyguards are also available for iPads for apps that have fixed layouts such as Proloqguo2go and CoughDrop. Follow this link to find out more about KeyGuards for keyboards and for iPads. This keyboard’s size allows it to be positioned easily on a desk or wheelchair tray. The small size and missing numeric keypad means that the pointing device (typically a rollerball, joystick, or mouse) can be brought in closer and thus make it easier to control. The most popular compact keyboard is the Cherry and a matching KeyGuard is available for those that need it. Follow this link to find out more about compact keyboards. BigKeys is a standard push-button keyboard but with bigger keys. The keys are 1″ square and are very clearly marked with text that is printed 11 times larger than that found on a regular keyboard. This obviously makes this a popular keyboard for those with a visual impairment. As it’s a based on the design of a standard keyboard, the BigKeys plugs straight into the back of your computer and no special software or drivers are required to run it. The BigKeys is also great for youngsters with motor difficulties (especially when using the optional keyguard) and due to its uncluttered designed the keyboard is also suitable for pupils with cognitive difficulties as well. Find out more about the BigKeys range of keyboards. The KidGlove inexpensive way of making your keys colour-coded and easier to see. This can also be used to protect your keyboard from fluids and works better than stickers which often peel off easily. The only disadvantage is that it gives typing a ‘squishy’ feel but the children I have worked with who use this keyboard don’t seem to mind! Following this link to find out more about the KidGlove keyboard. Ok, not a physical keyboard but I felt I had to include this as it’s so important. On-Screen Keyboards (OSKs for those in the know) are suitable for people who can’t access a standard or alternative “physical” physical. Most people are familiar with OSKs because they are in common use on iPads and smartphones, but most people don’t know that Microsoft Windows comes with a free built-in on-screen keyboard and has done for many years. The Windows on-screen keyboard can be accessed by mouse or mouse alternative, switch, or eye gaze, if you have the right hardware. Upgrades to the Windows on-screen keyboard include Clicker, ACAT and The Grid software. ACAT is the free and open-source system used by Stephen Hawking. Follow this link to find out more about on-screen keyboards. Hi Nan – I’m assuming that you’re using laptops. In that case it’s best to use an external keyboard and then when you change laptops you can keep the same keyboard. My favourite is the Razer BlackWidow 2014 Tournament Edition. Hi Charlie, my sister has cerebral palsy and a strong tremor which is making it very difficult for her to navigate around her android tablet with lots of accidental key selections. We have tried making the screen less sensitive but it is very frustrating for her. is there an android app you could recommend or would we be better off starting again on an apple tablet? Hi Mary Jo! There aren’t many touch accessibility options built into android or iPads, really. You can try making a glove to improve finger isolation and also try positioning the device vertically rather than flat. Touchscreens do remain quite difficult for many people to use, however, so you could consider attaching a nice big rollerball such as the Traxsys Roller II to your android device using an OTG adaptor.